If Sulley Muntari dies, will the Ghana FA mourn him? Sulley Muntari will die. Old, gray, and with many beautiful grandkids who adore him. Tributes will come in from the world over, mourning the passing one of Ghana’s most accomplished players who blazed the trail in many ways. Leading the flowery words in Ghana would be the football association, who would applaud his resoluteness and tenacity on the pitch, as well as his dogged convictions. What they will not say is how they failed him when the former midfielder faced crude, racist discrimination in May 2017. At that point, the football association would do well to be reminded that loyalty is royalty. It is not negotiable. It is not conditional. But it appears the Ghana Football Association, or at least the current crop; a group of some of the most brilliant minds in different endeavours, do not think so. With Konongo and King Faisal in his veins, Muntari carries Udine in his memory, Portsmouth in his smile, Milan in his brain, and most of all, Ghana in his soul. Muntari has worn the shirt of Ghana since 2001. He has served in the youth teams and, since 2002, the senior team. He has, consistently, shunned the threat of losing his positions with his clubs to feature for the national cause. It has never been said that club versus country rows have affected him, whether he was playing for Udinese or at his peak with Inter. Sulley has always been available. His 20 goals in 84 caps tell their own story. Of course, he is stubborn; a man of hard, often unshakeable convictions. And it is an attitude that, in a country like Ghana, gets you more enemies than friends. 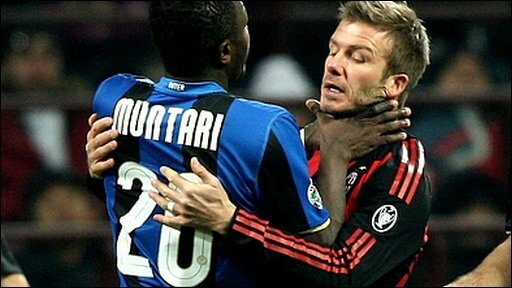 If Muntari believes a colour must be white, he stands by it to the end. The list of brushes he’s had with the law are many, but you cannot help grudgingly admiring his sense of self-worth. He knows who he is. And it seems that attitude is what he is being punished for. This past weekend, a nondescript Serie A game between relegated Pescara and mid-table Cagliari became a global headline story because home fans racially abused the midfielder. Muntari’s pitch walkout as well as comments from his own coach – “Muntari should not have walked off” – and the ref’s decision to show him a yellow card for asking the game to be halted, put the spotlight squarely on Italian football once more. But, with five days gone, there is still not a word from the GFA. The United Nations have spoken. Senior ex-players across Europe have spoken. Human rights groups have spoken. But the Ghana FA is quiet. How do we expect the Italians to take the matter seriously when the country of the affected player’s birth cannot be moved to speak for him? Sometimes, in this job, one tries to prompt officials about the right thing to do. I know many of my colleagues have asked FA officials behind the scenes to say something – anything – about this matter but they maintain a stoic silence. You see, Muntari is still a sore topic among the hierarchy of the Football Association, following their suspension of the player after the 2014 World Cup. 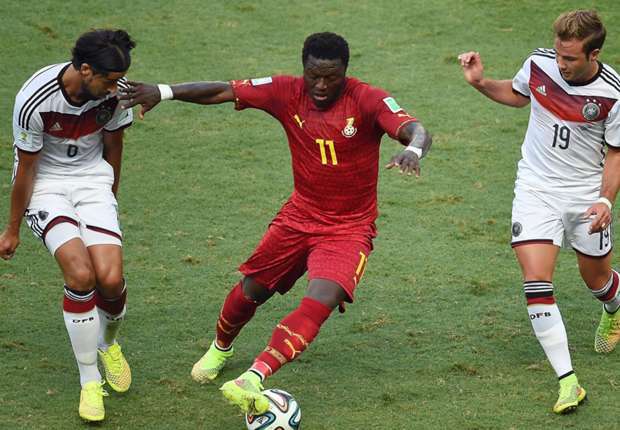 Muntari is accused of physically assaulting a Ghana FA official in Brazil, in the heat of the bonus row that crippled the team. The then Milan star and Kevin-Prince Boateng were expelled from camp. Since then, the mere mention of the duo’s names drives officials into fits of aploplexy. However, in this instance Muntari must be seen, first, as a Ghanaian. Racist abuse against a Ghanaian anywhere in the world is an insult to the sovereignty of the republic and it is the duty of the Ghana FA to represent all Ghanaians, everywhere. Forget whatever issues they have with the player, Muntari remains one of the most accomplished Ghanaian players of this generation. Need a reminder? Three World Cup appearances, five African Nations Cup representations, an English FA Cup winner, one of only five Ghanaian winners of the European Champions League, and a man who has played under many of the biggest coaching names in the world. This line being towed is extremely disappointing, profoundly petty, irredeemably silly and a huge own goal for an association whose image among its countryfolk is already swimming in mud at the best of times. The recent appointment of Kwesi Appiah to lead the Black Stars brought some warmth among fans because the 56-year old represents something of a rallying point, but the lack of empathy for Muntari is simply unforgivable and two steps backward. The GFA must be inclusive, must be a uniting force, and must be a mature organization that stands for the history, the pride and the promise of a glorious, Ghanaian future. At the moment, they risk looking spineless, and are set to lose their stance as one of Africa’s trailblazing associations. And that’s just a pity.